I’d like to say a big thank you to the Minnesota Timberwolves for their recent donation to Life Time Foundation. Since day one, the Timberwolves have been a support to our foundation and our mission of helping kids lead happy and healthy lives through physical activity and school food. 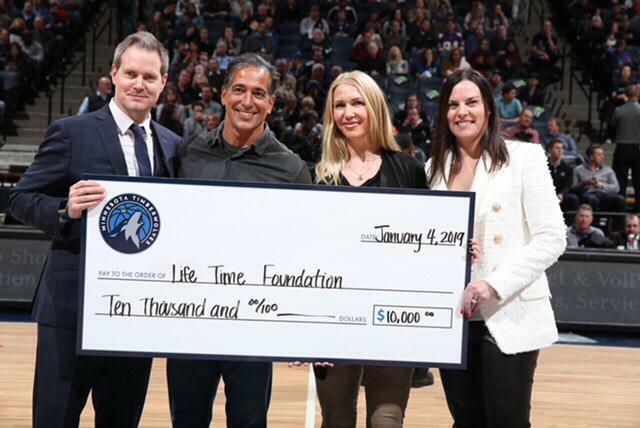 Last Friday, the owners and management of the Minnesota Timberwolves made a donation of $10,000 to the Life Time Foundation at center court during half-time in the game against the Orlando Magic. As a member of LTF’s board, I assure you that we will use every single dollar to clean up school lunches. This year alone 310,000 students at 544 schools will be served 44 million healthy meals as a result of the Life Time Foundation’s support. Of these schools, 98 are from Minnesota school districts. The Life Time Foundation is making Minnesota a hub of school food reform and an example for states across the country. I’m appreciative of the work our organizations are doing collectively to improve the health and wellness of our communities and, in particular, to help children live healthy, active and happy lives. – Bahram Akradi, Founder, Chairman and CEO, Life Time. Kids deserve healthy, real food! I’d love to hear from you – how do you make sure your kids eat healthy food, both at home and at school?